Public Health Surveillance, THR Education, Advocacy and Justice, THR Research, Cancer Risks and Communication, THR Business, US Election, US Election, Obama Still Using Nicotine, FDA, FTC, CDC, DOT, TPP, Taxation, Litigation, Vaping Bans, Minimum Age Laws, WHO FCTC COP-7, Graphic Cigarette Pack Warnings, Flavoring Bans, More Junk Science - Propaganda - Lies, Opioid / Marijuana THR. Minnesota teen survey finds cigarette smoking rate among 11th graders plummets from 12.2% in 2013 to record low 8.4%, finds just 2% of teens vaped 20 or more days in past month; anti-tobacco/vaping extremists respond by attacking flavorings, vaping, cigars, smokeless tobacco and the tobacco industry. Are people dying because vaping is being demonized? Millennials think e-cigarettes are safer – Ohio State does not; DHHS funded vaping opponent Peter Shields absurdly claims "We have no idea where in the spectrum these are, in terms of safety. Are they like cigarettes, or nothing like cigarettes? Do they affect people the same if they've never smoked, or a lot worse? We need to figure this out." Study finds 75% of Swedes who began using snus after they were smokers completely quit smoking, including 30% who subsequently quit all tobacco use; finds those who began daily tobacco use using snus were far less likely to subsequently take up smoking than those who had not, both among males (18% v 46%) and females (8% v 40%); finds snus was reported as the most common smoking cessation aid among men and yielded higher success rates than NRT and other alternatives. Report finds local councils in UK ignore Public Health England advice endorsing vaping in workplaces, 87% ban staff and visitors from vaping in council buildings. Study estimates graphic warning labels on cigarettes (i.e. those required by Sen. Enzi’s 2007 amendment to TCA and mandated by US Congress in 2009, but unconstitituitonally implemented by Obama’s FDA in 2011) would reduce cigarette smoking by 5% in short term, and by 10% in long term. 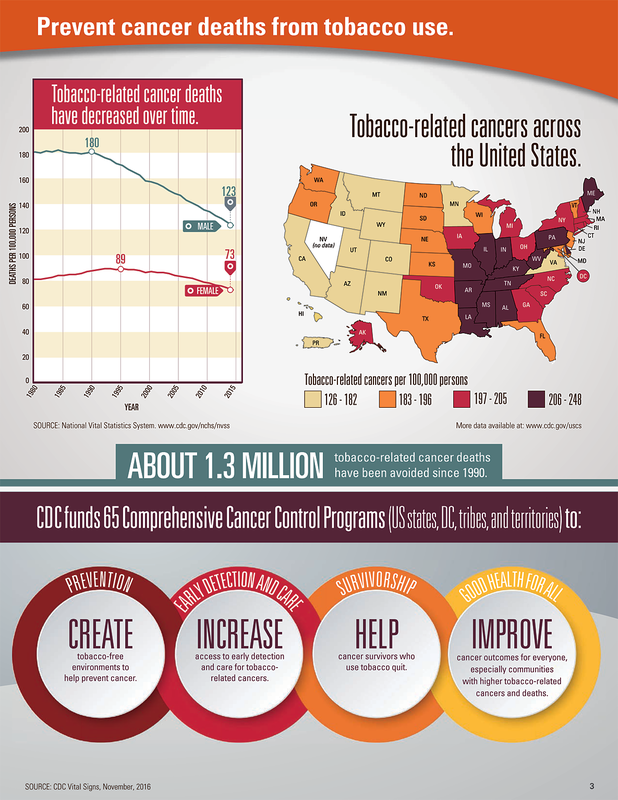 CDC manufactures and hypes “Tobacco-Related Cancers” (i.e. 12 types of cancers that are caused by cigarette smoking, but include many cancers that aren’t caused by smoking or by other tobacco use), deceptively insinuates tobacco use causes 40% of all cancers and 343,347 cancer deaths annually in the US (even though ALL of CDC’s estimated 167,000 tobacco attributable cancer deaths were attributable to cigarette smoking); deceives public to believe low risk vapor (redefined as tobacco) and smokeless tobacco, and occasional cigar/pipe smoking pose similar cancer risks as deadly cigarette smoking. After allowing FDA to lie about and ban sales of lifesaving vapor products twice, President Obama tells Bill Maher he’s still “chewing the heck out” of Nicorette. Nicopure v FDA: Vapor plaintiffs joint supplemental memorandum urges court to swiftly reject FDA’s assertion that nicotine free e-liquids are regulated tobacco products. Chowdhury/Chaput: FDA’s December 31 establishment registration and product listing deadline is fast approaching – Are you prepared? CDC vapor prohibitionist and propagandist Tom Frieden congratulates himself and CDC (not vaping) for the huge decline in cigarette smoking since 2010. CE I/ CASAA v DOT: CEI / CASAA file reply brief points out the airline smoking ban was solely intended to ban smoking (not the use of lifesaving vapor products), criticizes DOT’s attempt to redefine smokefree vaping as smoking in order to ban vaping. Cigarette companies increase cigarette price by $.08/pack in US after voters increased CA cigarette tax by $2/pack. NY Times article deceptively portrays 67% vapor tax in CA and FDA’s vapor ban as benefiting public health, repeats many false claims about vaping by Big Pharma funded ALA and by Obama DHHS funded Stan Glantz. NPR article misrepresents why cigarette companies support a MO cigarette tax hike, and why Big Pharma funded CTFK, ACS, AHA, ALA oppose the tax hike. Louisville Health Dept falsely claims their survey found 58% support their proposed workplace vaping ban; except it wasn’t a survey, but rather more anti vaping propaganda lobbying for their vaping ban. Clive Bates: WHO tobacco meeting – could the FCTC do something useful on vaping? Clive Bates & Sally Satel: Could changes to global tobacco treaty harm health? WHO’s Margaret Chan claims concern about tobacco deaths, but promotes policy changes that have NOT reduced cigarette smoking (e.g. plain packaging) and made it far more difficult to reduce cigarette smoking (e.g. banning very low risk vapor and smokeless tobacco products, increasing taxes on smokeless tobacco products), praises vaping prohibitionist Michael Bloomberg for buying title as WHO global ambassador. WHO FCA Policy Briefing on E-cigarettes acknowledges “divergent views”, recommends COP to “not engage in a lengthy debate on this topic”, urges COP to request “WHO to prepare an expert report for COP-8”. WHO FCA Policy Briefing on Articles 9 and 10 of FCTC acknowledges that mandating very low nicotine levels in cigarettes poses “serious risks of unintended consequences”, wisely urges COP to defer action on regulation of addictiveness/nicotine. Faith Goldy: All journalists kicked out of Delhi nanny state conference! WHO FCA attacks tobacco growers in Malawi for exporting tobacco, tries to put them out of business (despite no evidence that doing so can reduce cigarette or tobacco use). WHO FCTC COP-7 Secretariat feigns concern for tobacco growers during closing remarks (after COP imposed irrational policies to ban/reduce tobacco growing and prohibit tobacco growers from attending COP meetings). WHO FCA COP Bulletin criticizes tobacco industry for opposing plain packaging tobacco laws (despite no evidence Australia’s 2012 law reduced smoking or cigarette consumption); falsely insinuates plain packaging laws reduce smoking and benefit health. - found just 4.3% of participants reported vaping <3 days in past month at baseline. Big Pharma funded AAP Pediatrics publishes junk study on flavored e-cigs that falsely classified youth who answered “Probably Not” to questions about possible future cigarette smoking as intending “to initiate cigarette smoking” to falsely claim teens who have used a flavored e-cig are more likely to smoke cigarettes in future; news media repeats false claim as factual. FDA/NCI funded RAND study falsely classifies youth who answered 2-10 (on a scale of 1-10 with 1=Definitely Not and 10=Definitely Yes) on any of three questions inquiring about potential future cigarette smoking as “high susceptibility” of future smoking; finds youth who weren’t shown tobacco displays (because they were hidden) in a mock convenience store were less likely to answer 1 on all three questions) than those who were shown tobacco displays; finds more participants correctly guessed the purpose of the not-blinded study than answered 2-10 on any of the three questions; advocates banning retail tobacco displays from being seen by adult customers (even though a less restrictive MA retailer regulation was struck down by SCOTUS as unconstitutional in Lorillard v Reilly in 2001) to purportedly reduce susceptibility of future youth smoking. Legacy lies initiative falsely claims banning vapor and smokeless tobacco sales at retail stores prevents teens from smoking and supports smokers who are trying to quit. Dr. William Sturrock touts junk studies to demonize vapor and smokeless tobacco products, claims there is “no such thing as a less dangerous consumption” of tobacco. Josh Bloom: Have opioid restrictions made things better or worse?